I did this for Glitter Girl's challenge to mix manufacturers. I started with the photos, and took out a stack of paper. I like to keep some favourite sheets of paper that do not fit into any other of my theme/company organization folders in their own stack. That way I get to see all my favourites often and I can mix and match to use them. I picked out a few sheets that worked with the photos and then matched embellishments by colour. 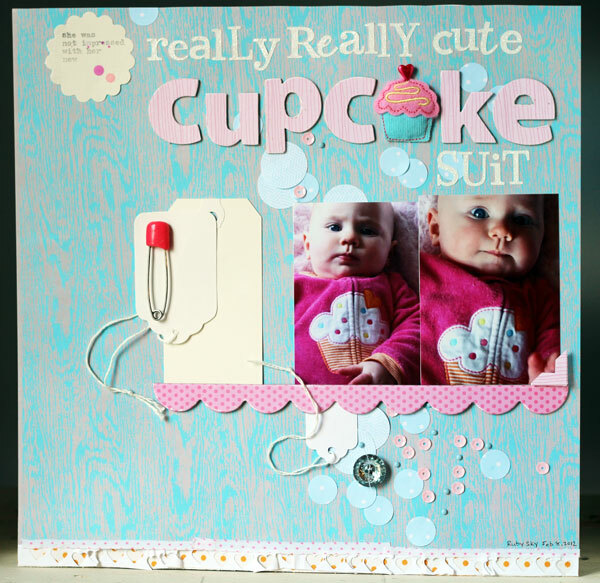 And, I finally used the cute KI Memories Puffy cupcake embellishment that my mom bought for me to use when I scrapped photos of her in this sleeper! My mom gave Ruby Sky this stinking cute cupcake sleeper for Christmas. When we opened it up and showed her, she just happened to sort of sneer and raise her hands into a shrug. It was hilarious. I typed "she was not impressed with her new" on the scallop tag, so then the title acts as the rest of the journalling. Not much to say about this one, just want to remember her hilarious apparent dislike of the cute, cute sleeper. 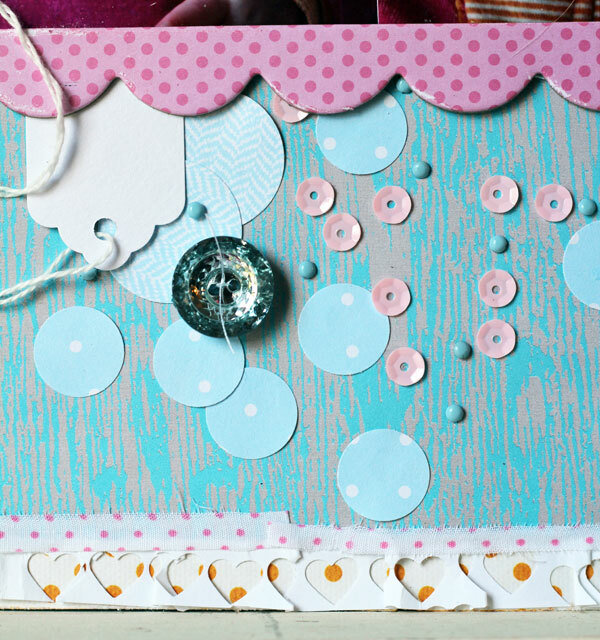 The chipboard letters are covered with Martha Stewart pink woodgrain paper from this year's Valentine's Day paper pad. 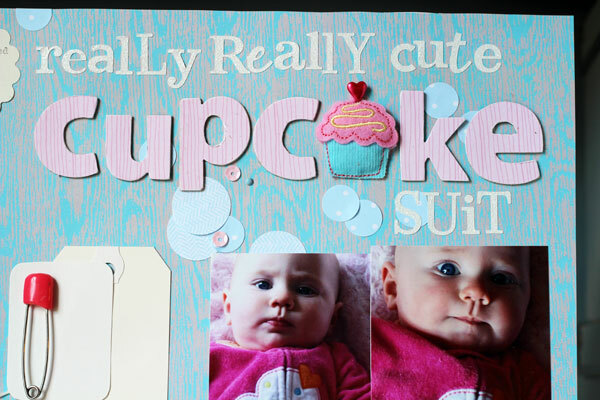 I used the felt puffy cupcake instead of a letter A, and stuck a Making Memories heart pin into the top, just like the cupcake on her sleeper is topped with a heart. Big, big confetti! Big confetti! Iddy-biddy brads! Supplies: patterned paper (Sassafras, Little Yellow Bicycle, Martha Stewart, Recollections); letters (unknown chipboard, Making Memories glitter stickers); tags (the Paper Company, Avery); chipboard border (Bella Blvd); sequins and button (The Girls Paperie); punches (Recollections, Fiskars, Martha Stewart); puffy embellishment (KI Memories); pen (Sakura); diaper pin (left over from our cloth diapering days). So cute...the sleeper AND the layout! Love how you used the cupcake to represent the letter A, and the mix of confetti and sequins!